I went to Lemongrass. 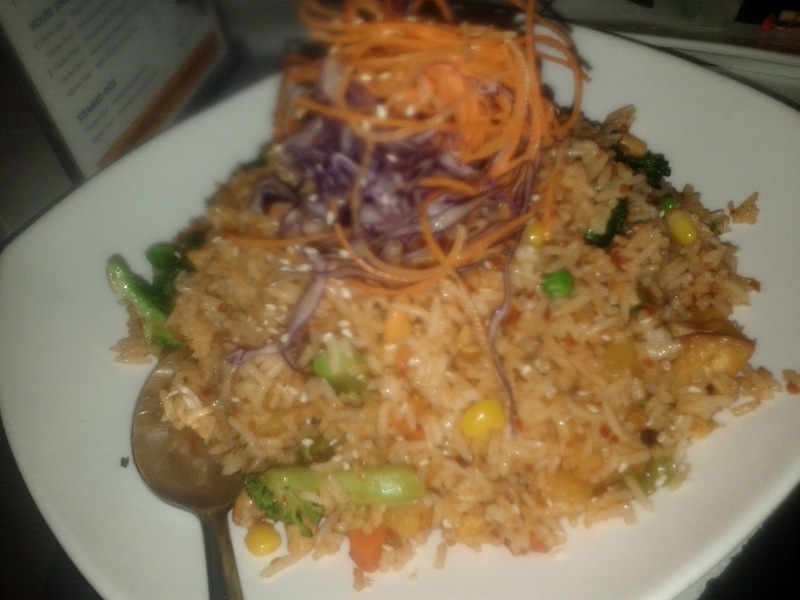 I love Lemongrass. This restaurant is located at Islington and Bloor in Etobicoke (Toronto). The take out menu clearly indicates gluten-free options. 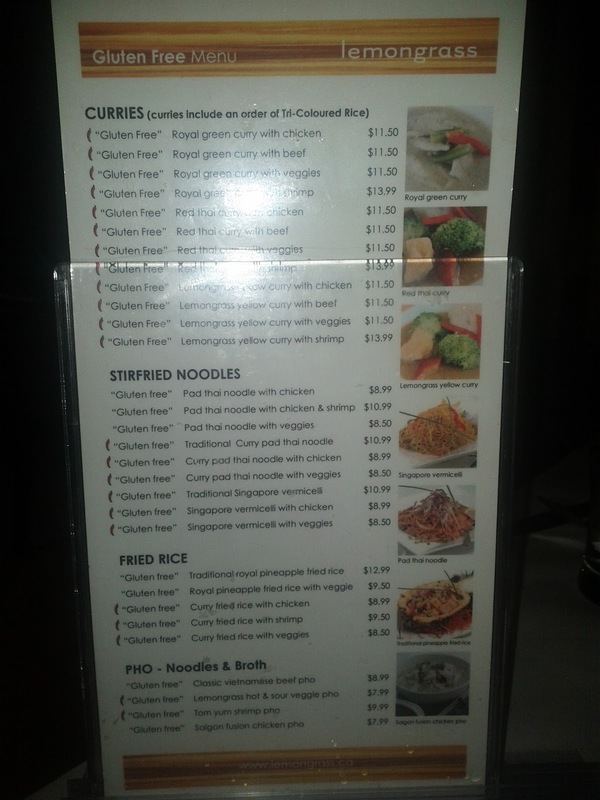 When I sat down in the restaurant, I was really disappointed to see that the big menu makes no indication of gluten-free options. Luckily I had grabbed the take out menu on the way in so I could make an informed decision. 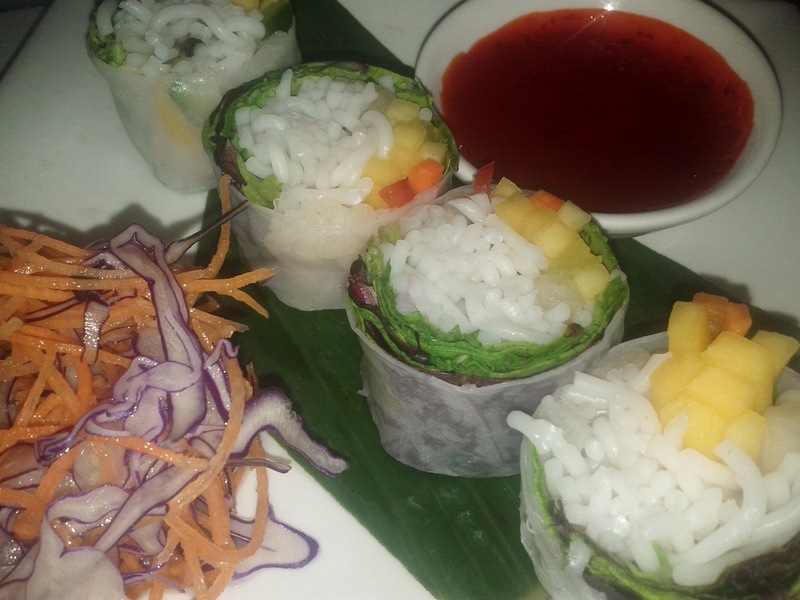 While not stated right on the menu, I am told the cold rolls are gluten-free when served with red sauce instead of the peanut sauce. Boy are they yummy! Maybe I had the wrong setting on my camera... oops. But you get the idea. After I had already ordered, I noticed a little menu on another table. I grabbed it, thinking it was the dessert and/or drink menu. Turns out, they have the gluten-free options conveniently written out! Makes it much easier to identify what is safe and order accordingly. As you can see, there are lots of options so if you're in the area, you should check it out! My sister took me to the Mississauga location a few weeks ago while I was visiting. 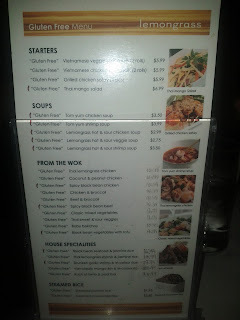 The server got me a take-out menu when I asked about the gf options, which seemed endless. The food was great too. We got some fried springrolls and both the server and the manager said they were gf (along with the peanut sauce) as they were also made with rice paper. My only complaint is that our two spicy dishes weren't very spicy. A bit more zip would have been nice.